Curves Weight Loss Centers: Is Curves Weight Loss For You? Created exclusively for women, Curves weight loss centers across the world offer a comprehensive, take-the-guessing-out healthy weight loss solution. Curious about the reason for the astonishing success of the program experienced by more than 4 million women in the last decade and a half? Well, it is the specific system at any Curves for women fitness center, which gives you the right mix of slimming workouts: cardio, strength training and interval training. When you talk to women who’ve been through this, it appears that any Curves for women fitness center provides you with a guaranteed formula to burn body fat efficiently, flatten your stomach, shape up and enjoy better overall health. Believe it or not, their proven, 30 minutes fat burning, whole body toning routine is equivalent to a 90 minutes regular workout. With more than 10,000 Curves for women locations worldwide and a motto like “no men, no makeup and no mirrors” (which won’t pressure you to dress up or feel self-conscious about being seen working out), you don’t really have any excuse for not joining a Curves for women fitness center near you. Thanks to CurvesSmart™ cutting edge personal coaching system (available at select Curves for women locations), you can forget about losing your exercising motivation. The equipments in the Curves circuit are programmed with your info, adjusting automatically to your body’s optimal endurance level. As a result, you will stay challenged and highly motivated during every workout. How’s that for a smart workout? What’s in it for YOU at a Curves for Women Fitness Center? 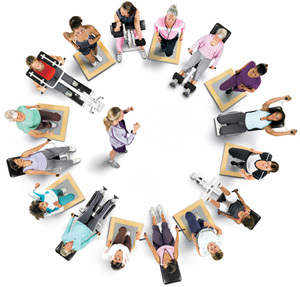 As an extension to their 30 minutes structured program, any Curves for women fitness center offers expert advice, specialized books and the nutritional supplements to help you achieve your weight loss goal. In addition, you get access to CurvesComplete – a new online subscription program with a variety of helpful tools: a customized meal planner, exercise tracker, healthy recipes database, expert support and a motivating online community that you can access anytime, anywhere. With Curves new and improved weight management program, you can get a week’s worth of free weight loss training classes. Apart for an initial registration fee, Curves membership is $30-40/month – prices are different for different centers, so call around and ask. …How Did Curves Weight Loss Centers Start Out? Well, fitness veterans Gary & Diane Heavin opened the first Curves fitness center in 1992 in Harlingen, Texas coming up with the innovative idea of a multiple-station circuit workout routine in a comfortable, women-supportive atmosphere. Experiencing an amazing overnight success, they realized they’ve tapped into a market not served by traditional gyms and they franchised their idea in 1995. A decade later there were 7,000 Curves for women locations operating worldwide. Today, there are more than 10,000 Curves weight loss centers in 60 countries, including the US, Canada, the UK, Australia, New Zealand and more. They make it convenient for busy women like you to come in with little time to spare, get on the highly effective, no-guessing 30 minutes workout circuit that gives you permanent results – and be back to work or wherever you’re headed in the minimum of time.